See if there are any conflicting requirements and how best to resolve them. For eg. Ubuntu touch needs apparmor patches in kernel, while Sailfish doesn’t. Decide what the stack will contain and make a short summary of the whole thing. What infrastructure we will need for this? What are options? Fork https://github.com/mickybart/gnulinux_support / make pull requests? Distributions picks up this new packaging if they are using our reference packaging for userspace (Linux) parts, otherwise they build their own packages. 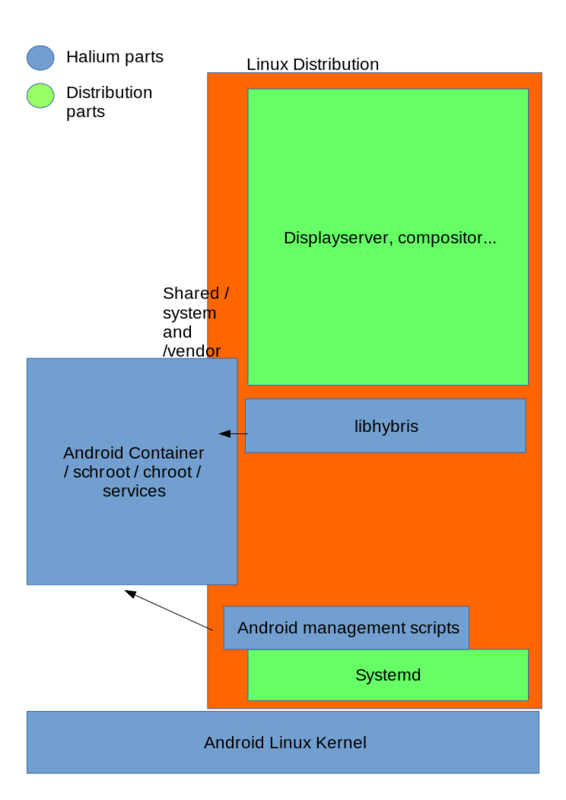 Systemd start’s up the system and the android HAL, which runs either in a schroot, container, or directly on the system. Graphic output, camera and other sensors are managed by libhybris. Jolla guys potentially interested but too early to commit to this. We need a proper proof-of-concept to show mer could run on top. Sailfish OS community devs of course anyone is welcome. Jolla was concerned about how our things work with the ODMs way of things. This may not be a problem for community projects like ubports, plasma, et. al. but especially for Jolla since they’re dealing straight with the ODMs. Something to take into account when we build our infrastructure. We should make it as flexible as possible so that this would work with them also.